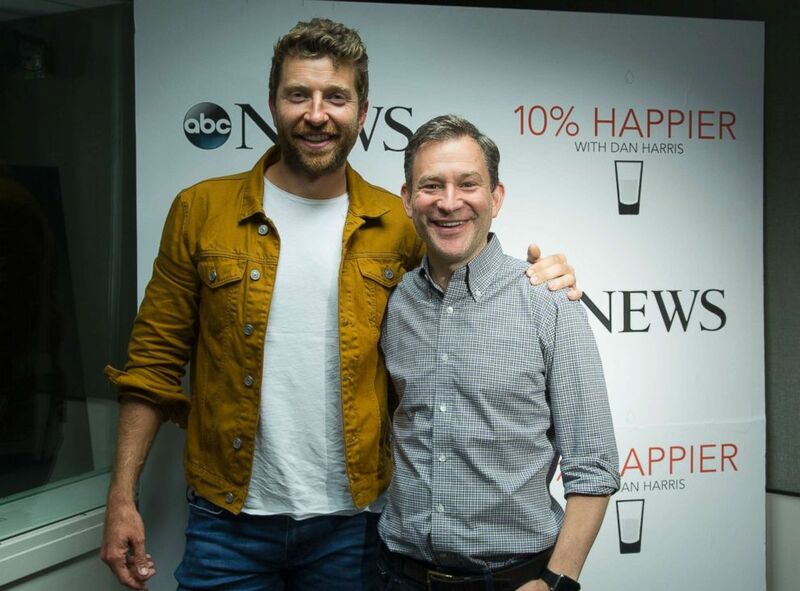 Brett Eldredge sat down with ABC's Dan Harris for the "10% Happier" podcast. Platinum-selling country artist Brett Eldredge has a headlining tour, sold-out venues, hit songs, adoring, loyal fans -- even an Insta-famous dog. But while he feels right at home performing in front of a packed arena on a Saturday night, the singer/songwriter says he has struggled with panic attacks and anxiety for most of his life, and at times it's made it hard for him to celebrate his successes. 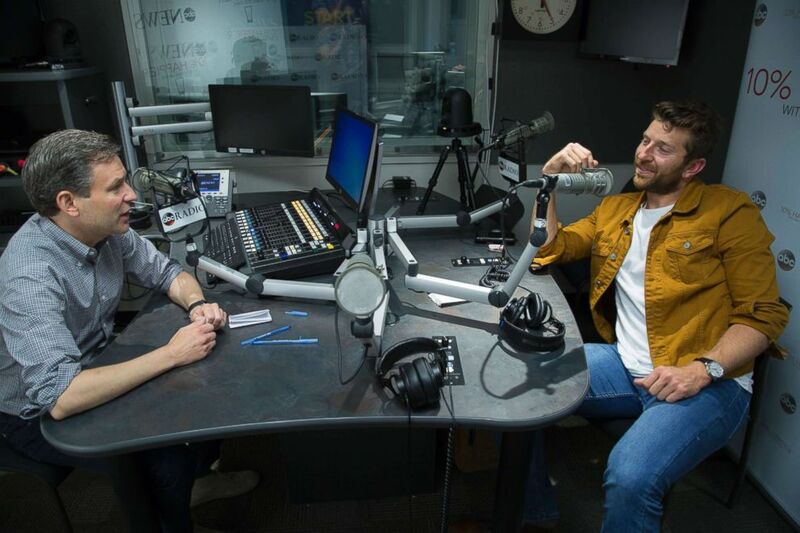 (Jeff Swartz/ABC) Brett Eldredge (right) is seen here during an interview for the "10% Happier" podcast with ABC's Dan Harris (left) on Aug. 22, 2018. Eldredge, who has had six number one hits on the country charts to date, including "Drunk on Your Love," "Lose My Mind" and "Beat of the Music," said the panic attacks started when he was a boy growing up in Paris, Illinois. The “Wanna Be That Song” singer remembered some nights where, lying in bed, he'd feel short of breath or feel like his arms were numb. His anxiety would manifest itself in “a very physical” way, he said, and he carried it with him into adulthood. Eldredge said years ago he went to the emergency room “several times." As a rising country star, Eldredge said feelings of self-doubt would creep in before a show. He would ruminate on it for hours, and sometimes working himself up into thinking the crowd would see him fail. But once he could get out on stage, he said the fear would melt away. Once, at a show, Eldredge said he became so overwhelmed from panicking that he almost passed out right before walking on stage. “This crazy music's going on and you know... you build energy before you run out there on stage and [the announcer says], 'Hey, the star is here to sing songs for you,' whatever. And I remember I was like, 'I don't know what's wrong with me but I'm freaked out and I'm short of breath and I'm seeing stars,’ and I had to sit down on the side of the stage," he said. "Then I get out there, and eventually it's OK."
Eldredge said sometimes the self-doubt he carried made it hard to appreciate his big successful moments. Eldredge remembered being at a party to accept an award for his first number one hit, "Beat of the Music," being the most played country music song of 2013. 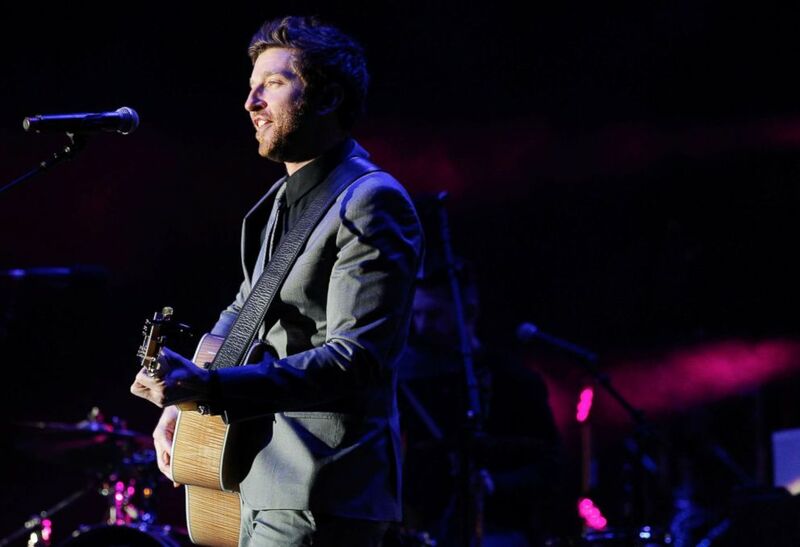 (Terry Wyatt/Getty Images) Brett Eldredge performs at the Fifth annual New Year's Eve Bash on Broadway in Nashville, Tenn., Dec. 31, 2013. Eldredge said he has sought out ways to help his anxiety over the years, including seeing a therapist. But he said it's really been in the past two years that he's focused more on being physically and mentally healthy. He said he exercises, spends time outside, eats well, tries to get enough sleep. He also started a mindfulness meditation practice using the “10% Happier” app, and he's become known for gratitude journaling — the one he uses is “The Five-Minute Journal” — which he often shares on Instagram with his 1.3 million followers. Eldredge said he tries to limit his phone and social media usage. He shares his gratitude journal entries with fans every couple of days or so to show a more personal side. He used to share what he called "bedhead jams" — videos of him singing songs right after he'd wake up in the morning. But eventually, he said what started as a funny video began to feel like a daily obligation and then it became a burden. "People would get upset that I hadn't done it [posted a 'bedhead jam' video]. ... Then I was getting more stressed, and then I still had to play a show," he said. Another important aspect of Eldredge's life has been his dog, Edgar, who travels with him on the road. The beloved Weimaraner is a regular fixture at Eldredge's shows, and he's become an Instagram star in his own right, with 208,000 followers. Having him around has been "amazing," Eldredge said. "I might play in front of 30,000 people and then I walk off — and this is really hard to explain to people because it's such a weird experience — but walking off stage and going onto your bus, and you're by yourself after having the most insane adrenaline rush ever," Eldredge said. "Everybody's going crazy... people give you high-fives, and then [you climb onto] your bus and it's just you and the walls of a tour bus. I'd be there by myself. Now I've got Edgar to be there with me. It just made me more happy." Looking toward the future, Eldredge said he wants to continue to work on his mindfulness practice and being kinder to himself when it comes to career expectations. Listen to the "10% Happier" podcast for free on Apple Podcasts, Google Podcasts, Spotify, Stitcher, TuneIn, or the ABC News app.